On one hand British farmers are being paid so little for fleece that it makes sense to burn them instead of selling them. You can read more about the current state of the wool market in this great blog post from Rachel Atkinson. On the other hand there isn’t enough British Bluefaced Leicester available for us to keep putting it into Britsock. There’s also the issue of price – one of the mills we deal with is of the opinion that the fleece is no longer good value, and rising feece costs mean rising yarn prices. So the Bluefaced Leicester will be replaced with Polwarth fleece from the Falkland islands. I loved this fibre when John Arbon showed me a sample of it, and it’s produced an almost identical yarn. So close to identical that I can’t tell the difference, and I’m taking that as a very good thing. Polwarth sheep were bred in Australia by crossing Merino and Lincoln bloodlines, and fine wool is one of their defining characteristics. While I know some people hate change of any kind I’m hoping that this is one that shouldn’t cause anyone any grief – but please do shout up if you have any questions or queries. We’re going to continue to sell the yarn as Britsock because it seems redundant to set up a new name for such a similar product. 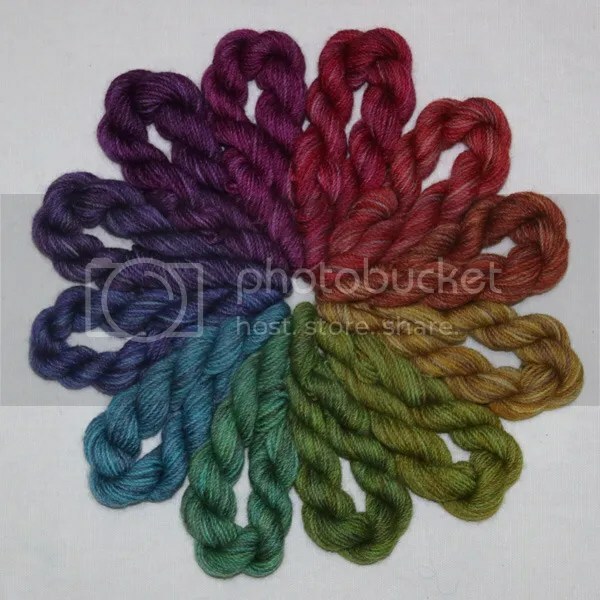 So for a while there will be two batches of Britsock in the shop and the details beside each skein will tell you if it’s the Bluefaced Leicester or Polwarth version. One interesting thing that happened at Yarndale was several customers asking if we had yarns without Bluefaced Leicester as they couldn’t tolerate it next to their skin. I’m not sure if this is because poorer quality wool is being used or if yarn which is labelled as Bluefaced Leicester is something else. Either way, we’ll now have a Bluefaced free option. The first of the new Britsock will be in the shop this Friday when we’ll have lots of colour wheels for you. These were a massive hit at Yarndale, and we’ll have an even bigger selection that we did at the show. Tomorrow I’ll be blogging about all the different colour wheels we’ll be offering so you can start making plans.